The Acton Blink Lite so far is the world’s lightest electric skateboard. This wonderful road skating apparatus has the capability to take your breath away when riding it because it packs all the necessary tools you need to get you where you are going and to make you enjoy your skating sessions more. It is lightweight in size so you can easily carry it by hand anywhere you are going. Riding the Blink to your next destination will let you get anywhere you are going in a safe and comfortable way. The Blink manufacturers leave nothing to chance. They designed the machine with many wonderful features that will still leave you guessing. All the facets of the Blink are in place to make you feel in control of the machine so that you will not feel awkward riding it. Having such an innovative technology skating board in your possession will leave you looking and seeming like a pro to onlookers around you. The awesome features of the Acton Blink Lite light electric skateboard vary. These different traits are assembled as part of the apparatus to give you total control when you are outdoors skating. In fact, they are so amazing that you just cannot ignore them and cannot wait to get your hands on a Blink board. The safety lights are built into the machine so you can see where you are going if it should get dark when you are outdoors skating. Not only will you see where you are going, but drivers can make you out in the dark. Acton Blink uses powerful lithium batteries that last longer. Therefore, you can skateboard for up to five miles without having to recharge the batteries. This means you can travel for hours and have the fun you want. The machine weighs only 7.7 lbs and thus has easy portability function so you can carry it by hand. It is a perfect apparatus for you to carry to other locations such as at school, work or other sporting activities. By just the press of a switch, you can get your machine to reverse, move forward or cruise at any speed you choose because it carries a Bluetooth remote attachment as part of its makeup. Riding at nights can be dangerous and so the manufacturers of the product made it with safety led lights to light the way. Motorists therefore can make you out in the dark as you ride your way to your next destination. Wheel measurements are 70mm and can take on any trail because they are made from strong polyurethane material that ensures toughness and a longer lifespan. The wheels place you in a safe mode to roll over cracks and some debris without you falling over. Since the machine has a smartphone app attached to it, you can connect your phone to your board, especially when you are in remote areas. With the app in place, you can set the charger to your board and even check the type of performance you are getting. The board material that the product carries is made from tough Canadian maple wood, which means it will not split easily and will give long life. 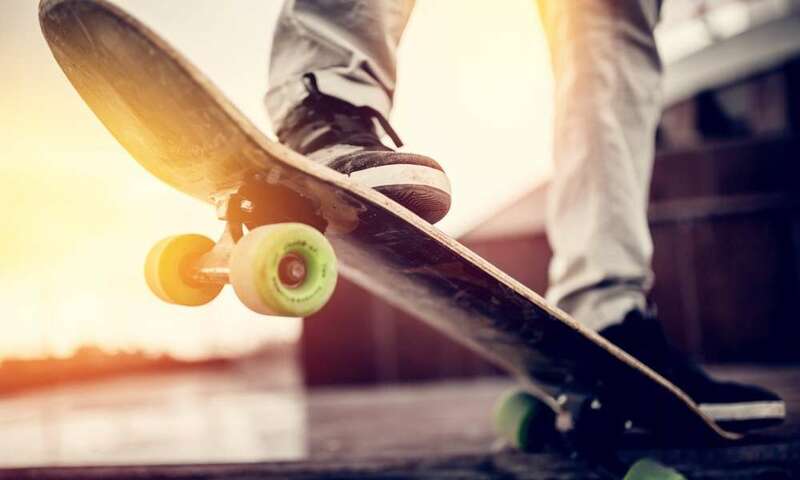 Therefore, while riding your skate in the outdoors, you will have no fear of it coming apart as you are cruising on it. Being outdoors practicing skating maneuvers with your board will be an unforgettable experience you cannot afford to forget. With each feature in its place, your skating experience will take on new meaning. You can ride in comfort and safety each time you mount your skate buddy and in addition your skating time will produce great health benefits such as patience, determination and the willingness to learn new tricks that will enhance your character. When compared to two other products in the same industry, Acton Blink seems to come out on par. We looked at BLITZART Huracane skateboard and MotoTec MT-SKT 1600w and noted some differences. The BLITZART is a great competing machine that needs no introduction. Its speed is up to 17 mph and can reach 15 miles before coming to a halt. Since the Blink is lightweight in size, it can run for only 5 miles. Clearly we can see that the BLITZART has more stamina in it than the Blink. The MotoTec board is operational on AH batteries while the Acton Blink is a lithium operated machine, which clearly makes the blink a better powering board to have. Like the MotoTec, the Blink carries adjustable speed that puts both products on the same level. Acton Blink Lite electric skateboard can hold its own against some of the finest boards in its genre. Although it may come up short in some features against other models, still it makes up for it in other ways. It is the world’s lightest skateboard and this is a plus for users like you because it is easily portable. Without a doubt you will be one of the people who will be breaking through the technology barrier when you buy one of the world’s lightest boards, which is the Blink Lite. Riding the Blink to and from various locations will set you apart from the rest of the skateboarders because you will be on a more technologically built machine. It is a super lightweight device that is smart and built with modern equipment. Riding on the deck-board of the Blink will make you stand out from the crowd and give you a better perspective of yourself because it makes you reach a higher health beneficial place in your life based on the number of things it teaches you such as greater determination, patience and coordination.